Are you thinking about popping the question or saying “I Do” this year? 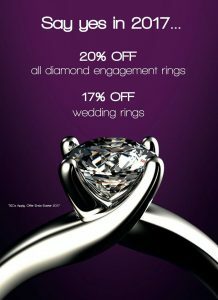 If so Richard Sinton Jewellers have the perfect offer for you with 20% off ALL diamond engagement rings & 17% off wedding rings. Offer ends Easter 2017, T&Cs apply. Ask in store or call them on 0191 232 0788 for more information.